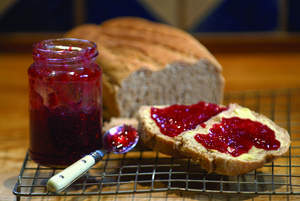 MISSION, KS--(Marketwired - Mar 14, 2014) - (Family Features) With fresh inspiration from the season's juiciest, most delicious fruits, you can create jams, jellies and other spreads with ease right from your own kitchen. For many, the thought of turning their favorite fruits into sweet and scrumptious jams and jellies may sound like countless hours in a hot, stuffy kitchen. But creating your own, homemade fruit spreads can be quite simple with the right ingredients and tips. "Any cook can create delightful jams and jellies, regardless of their canning abilities," said Shirley Camp, M.S., registered dietitian, licensed dietitian nutritionist and retired University of Illinois Extension master canner and educator. "There are so many great products, such as Mrs. Wages No Cook Freezer Jam Fruit Pectin, which allow you to whip up homemade spreads, without cooking, saving time without a messy kitchen." When picking berries, keep in mind these fruits have high water content and are very fragile. So, use smaller containers when picking them so the berries do not get crushed under their own weight. Due to their fragile nature, the berries should be lightly "rinsed" to remove surface dirt. Do not allow them to sit in water for very long because they tend to take on more water and will become mushy. When selecting berries for jellied products, ripe berries are best, but not overripe ones. Choose those that have good flavor and are still firm to the touch. For strawberries, look for the smaller, juicier berries instead of larger types that are available today. While many people prefer their jams to be one flavor, mixing two or more different types of berries together produces great jams with good flavor. Try a mix consisting of blackberry and red raspberry, or strawberry with red raspberry. Another great combination includes pureed berries and peaches mixed together to make jam. Red raspberry peach jam is always a huge hit. Whether you need a sweet topping for a slice of breakfast toast or a dollop for thumbprint cookies, these simple jam and jelly recipes are sure to please everyone in your family. From the ease of Fast Fruity Freezer Jam to the cool blast of Mint Jelly, these recipes all feature Mrs. Wages fruit pectin, which provides the perfect consistency to enhance all your favorite fruit flavors. In large saucepan, bring water and basil to a boil. Remove from heat, cover and let stand for 10 minutes. Strain and discard basil. Return 3 2/3 cups liquid to pan. Stir in pectin and food coloring, if desired. Return to rolling boil over high heat. Stir in sugar. Boil for 1 minute, stirring constantly. Remove from heat. Skim off any foam that forms on top of jam. Ladle mixture into hot, clean jars, leaving 1/4-inch headspace. Remove air bubble. Wipe jar rims and threads. Cover with two-piece lids. Twist lid bands so not loose but not too tight. Process for 15 minutes in boiling water bath canner. Pit unpeeled apricots, then finely chop or grind. Measure exactly 3 cups apricots into 8-quart saucepan. Cut, peel, core and finely chop pineapple. Measure exactly 2 1/2 cups pineapple into saucepan with apricots. Mix well. Add lemon juice. Add pectin and butter and stir over high heat until reaches rolling boil. Add sugar and stir thoroughly until reaches rolling boil. Continue cooking for four minutes, stirring constantly to avoid scalding. Remove from heat. Skim off any foam that forms on top of jam. Ladle mixture into hot, clean jars, leaving 1/4-inch headspace. Wipe jar rims and threads. Cover with two-piece lids. Twist lid bands so not loose but not too tight. Process for 10 minutes in boiling water bath canner. Combine sugar or Splenda No Calorie Sweetener (Granular) and pectin in bowl. Blend well. Stir in crushed fruit. Stir for three minutes. Ladle mixture into clean jars, leaving 1/4-inch headspace. Wipe jar rims and threads. Cover with two-piece lids. Twist lid bands so not loose but not too tight. Let stand for 30 minutes to thicken. Refrigerate up to three weeks, freeze up to one year. Combine strawberries, rhubarb, lemon juice and pectin in large saucepan. Bring to a boil over high heat. Add sugar, stirring until dissolved. Return to rolling boil and add butter. Boil hard for 1 minute, stirring constantly. In large pot on high heat, pour olive oil in and bring to almost smoke point. Add peppers and blister. Add cherries and sugar, reduce heat, then pour in water. Bring to a simmer to dissolve sugar. Add pectin and continue to cook for 15 minutes. Remove from heat. Skim off any foam that forms on top of jam. Ladle mixture into 16-ounce containers or freezer safe zipper bags.